In the quest to lose weight, the typical methods may not include resistance training. Many dieters look to cardio training as the way to lose weight and shy away from resistance training. Resistance training can add muscle to your body while helping you to lose weight and body fat. Adding a little muscle will increase your metabolism -- your body's ability to burn calories. This will not make you bulky and muscle-bound. Some resistance training programs are designed to give you a leaner look. When combined with cardio training and proper nutrition, resistance training works to maintain weight loss. Additional benefits of resistance training include stronger bones and a decreased risk of injury. Perform exercises using lighter resistance and higher repetitions. Select the resistance that still brings you to fatigue on the last repetition. Perform three to four sets of 12 to 15 repetitions. Work slowly with control, stressing proper form throughout the exercise. Rest only 30 seconds in between sets to increase workout intensity. Choose isolation exercises. Isolation exercises work only one muscle group at a time. This will increase the intensity for that muscle group, because no other group can assist. Examples of isolation exercises include chest flies, front raises for your shoulders, leg extensions and leg curls for your legs. All bicep and tricep exercises are isolation exercises. Add breakdown sets for extra intensity. An example would be for bicep curls. Start with a weight that you can do for 10 repetitions. Complete the 10 repetitions, then continue the exercise using less weight. Complete as many reps as you can, then continue to use lighter weights. Use four to five different weights for the set, completing between 30 and 50 repetitions. Add one breakdown set for each workout, choosing a different exercise and a different body part each time. 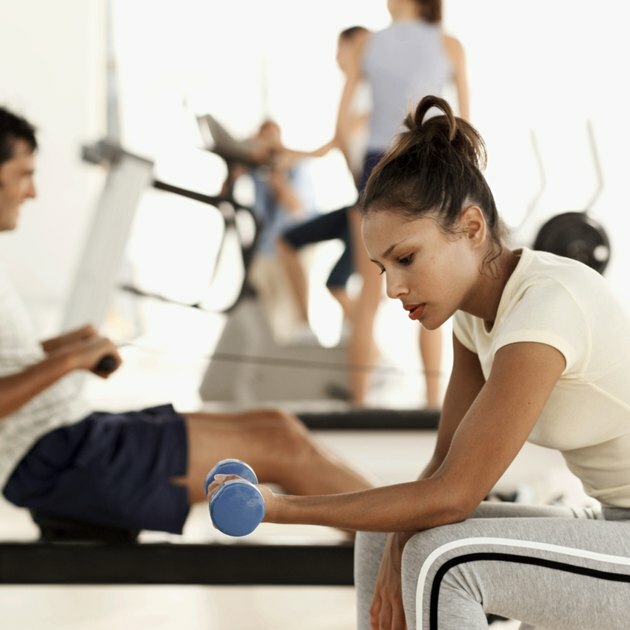 Vary your workouts with different types of equipment. Resistance training means that there is an overload that your muscles must overcome with movement. This can be weights, bands, gravity and your body weight. Resistance bands can be used for the same exercises that are done with free weights. The bands provide a continuous resistance that works your muscles through a full range of motion. Pushups, dips and pullups are performed using your body weight as resistance. Keep a record of how many you can initially perform, then challenge yourself on a weekly basis by trying to improve your total. Include resistance training with cardio workouts. Some elliptical trainers have arm and leg pedals providing an upper and lower body workout. Adding a 20 to 30-minute training session will save time by including resistance training with your cardio training. Include proper nutrition to ensure that your program is successful. When starting a resistance training program, weight loss may be slow to achieve due to the addition of some muscle weight. This will soon change as your additional muscle will help to burn excess body fat. This will result in a decrease in inches and fat. You will look thinner without having to lose as much weight as initially intended.